10-year-old Harini is suffering from a severe kidney disease. She is in a critical situation and requires a transplant at the earliest. 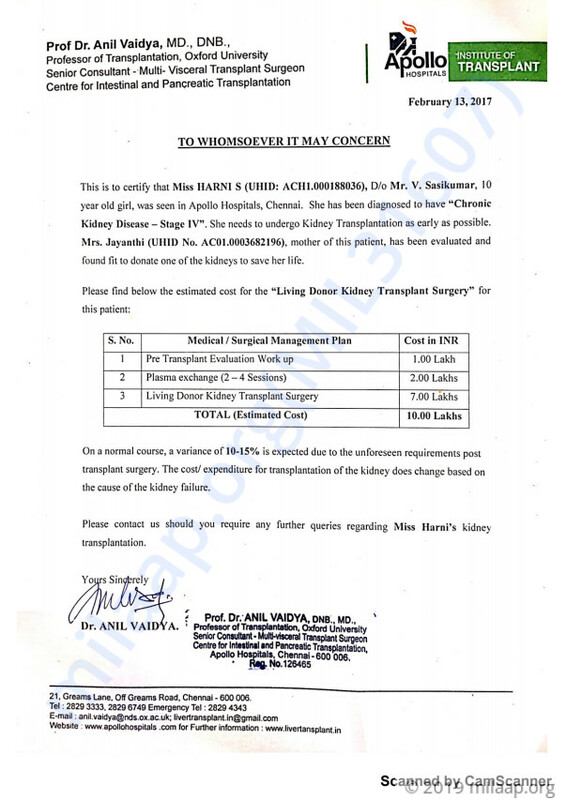 The total cost of the transplant is around 10 lacs. Unfortunately, the parents do not have the funds to afford the treatment and need our help. I am rejoiced by the love and support given to Harini. She is presently undergoing medications as dialysis had make her very weak. The kidney transplant has not been done yet. As per her health status, the doctors will let us know the same. Thank you. Will keep you posted! Here is a quick update on Harini's health. 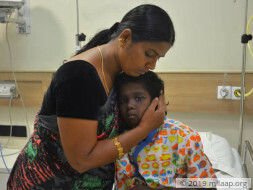 Harini has been admitted in Apollo Children's Hospital. She has undergone few sessions of plasma exchange and all set for her kidney transplant next week. Will keep you posted as her health progresses. Thank you all for your immense support. As of now, Baby Harini is doing well. She has been undergoing sessions for plasma exchange in preparation for kidney transplant. The transplant is most probably scheduled in next week till then she will be undergoing pre-transplant medications and procedures. She has been responding well to the treatment up till now but the doctors will still monitor her health because there maybe a chance of recurrence. We're really thankful to all of you for your love and support. Please pray for Baby Harini's recovery and a successful transplant.